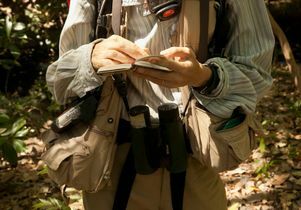 Susan Perry in the field in Costa Rica. 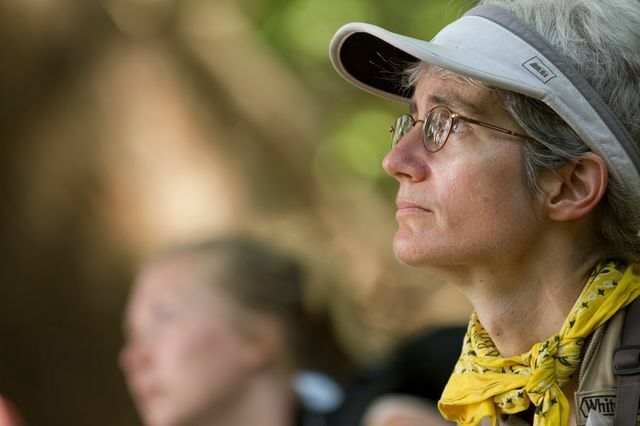 For 25 years, UCLA professor of anthropology Susan Perry has been climbing, crawling, slashing and sloshing her way through the Costa Rican dry forests of Lomas Barbudal in an unprecedented study of the capuchin monkey — a small, white-faced primate that populates large areas of Central America. Her Monkey Project is one of the longest continuous studies of a single species of monkey in the history of primatology. And what science knows today about the behavior of this monkey, and the conclusions that can be applied to other species, can be credited largely to Perry and the dozens of primatologists who have studied under her. 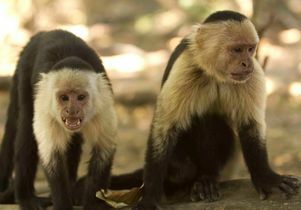 Capuchin monkeys in the study. There is little glamour in this work. Perry’s geographic research area initially was set aside by the Costa Rican government as a killer bee reserve. The fieldwork Perry and her team must conduct daily to collect data on the monkeys requires trekking through dense forests, running from wasps, crossing rivers, crawling under electric fences, and battling suffocating heat and torrential downpours. But for Perry, there’s no place she’d rather be, no work she’d rather do, and no research more significant. 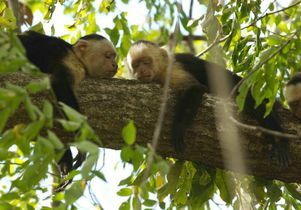 Her meticulous collection of data has revealed a complex social structure among the capuchins that has redefined scientists’ understanding of the way intelligent animals communicate, learn and survive. April 4, 2003, was hot and bone-dry. Sections of the forest were burning — a growing problem in an area increasingly susceptible to climate change and human interference. 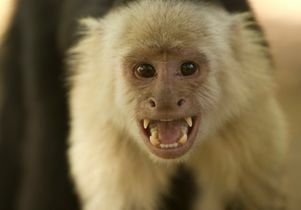 Capuchin monkey in Costa Rica. It was a typical morning, except for the fire nearby. Abby’s group — a 36-member clan named after the since-deceased female in charge when Perry first began her study — was resting and playing in their favorite spot: a quasi-island formed at the intersection of two small rivers. Rambo’s 38-member group was slowly but intently moving upstream, searching the forest for bugs and fruits. 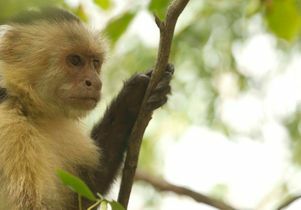 Observations of both groups have led to groundbreaking discoveries on the behaviors of the capuchin — and catapulted Perry into the position of a leader in primatology. 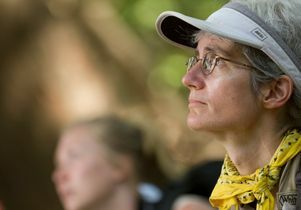 Abby’s group has been the cornerstone of her research since she set up her field site in 1990 in this remote region just outside the small city of Liberia. It was this group of monkeys that gave Perry her major breakthrough — that capuchins invent games, and that these eventually become rituals that are passed on through generations. 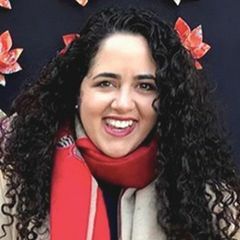 Over the years, she has discovered that each group has its own unique set of exercises — hand-sniffing, eye-poking, sticking fingers in one another’s mouths — all with the purpose of making bonds, establishing alliances and testing relationships. But every new piece of knowledge is obtained through grueling work. Perry does not tag the nearly 250 monkeys in her research portfolio — it would be too traumatic for the animals — and so every face must be memorized, every scar documented, every movement recorded. 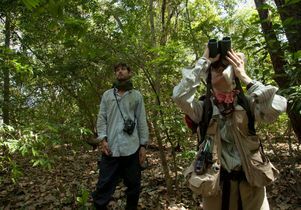 When the monkeys wake up high above the forest each day, researchers must already be present, and they must follow their subjects until the sun sets and the capuchins settle in for the night. 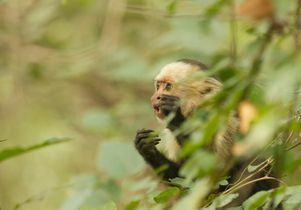 Because of this meticulous research, Perry can explain the dramatics of every capuchin she has studied in scrupulous detail — from a monkey’s siblings, parents and grandparents to its victories and defeats. And because the honor of naming a monkey falls on the researcher who first discovers it, a typical retelling of a monkey’s life story invokes the names of literary legends, historical powerhouses and Hollywood superstars. This April morning started no differently than other punishing mornings. Perry’s team woke up around 3:30 a.m. and — snake leggings wrapped around their ankles, EpiPens in the pockets of their cargo pants, and backpacks stuffed with enough water and food to last 12 hours — spread out to find Abby’s and Rambo’s groups before the sun rose over the forest. Perry had her usual two cups of leche con café (a lot of milk, just a little coffee), and headed to give a talk to a local community group as part of the Monkey Project’s conservation aspect, which educates residents on the importance of the capuchin. Her four research assistants spent all morning collecting data so precise — recording each time the animals eat, scratch, squeak and squeal — that the detailed retelling of this story 12 years later is possible by merely pulling up a spreadsheet. There were no signs that the dramatic events about to unfold would have effects that are still felt more than a decade later. Field research in Costa Rica. 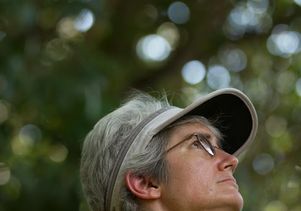 UCLA anthropologist Susan Perry has been researching capuchin monkeys in the forests of Costa Rica for 25 years. 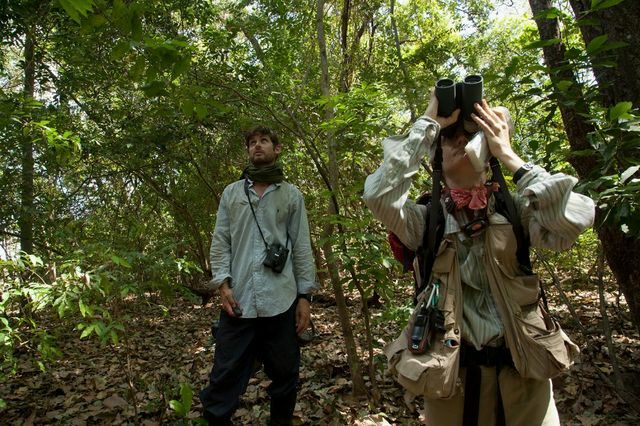 Prof. Susan Perry's 25-year study in the forests of Costa Rica is unprecedented in the world of primatology.